Let us create a small example to illustrate the problem. I have created a Microsoft Word document using Microsoft Word 2007. The document contains two similar images. The left image is a PNG file that was dragged into the document. On the right, there is an image that was opened using Paint and copied and pasted into the document. The size property of the left image was changes to match the right image for better comparison. Inside the Word document, the two images look identical. However, this is not the case. The left image contains the transparency information from the original PNG file. Whereas the right images does not. 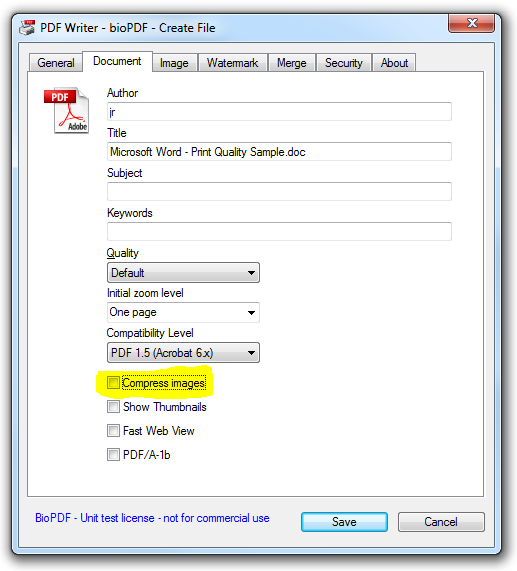 Let's see what happens when we try to print the document using the PDF Writer.